The plan was to make these beans with tomato and fresh mint. Then when my guests arrived I found out one of them couldn't have tomatoes. Faced with either telling the guest to please go home or improvising, I chose to be the gracious host. I was quite happy with the resulting dish AND nobody got angry with me. It was a good day. Put the olive oil, salt, and garlic in a large, cold saute pan and place over high heat. Just as the garlic begins to sizzle, add the onions and cook for 1 minute more. Then add the green beans and orange juice, reduce heat to medium, and cover the pan. Cook for about 5-6 minutes more (covered), then remove the cover and cook for another minute. Mix in the fresh mint and black pepper and serve. My grandma, born in Italy-raised in the USA, used to make this with the tomatoes. I serve it as well. 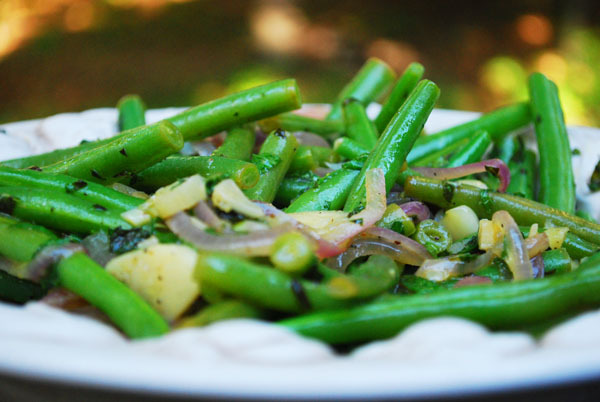 My southern husband never knew how good fresh green beans could be! Great post.